The flower is the modified shoot for reproduction. The stalk of flower is called pedicel. The expanded tip of the pedicel from where the floral parts arise is called thalamus. Calyx: It is the first whorl containing sepals. Sepals may be united (gamosepalous) or free (polysepalous). Sepals protect the inner part of the flower in the budding stage. Coloured sepals are called petaloid sepals. In some plants additional whorl of sepal is found below the calyx called epicalyx. Corolla: It is made up of petals . When petals are united they are form gamopetalous and when they are free they produce polypetalous. Petals are the most attractive part of flower which attract insects. Insects come for collecting nector and by the fault they help in pollination. As a result fertilization takes place and flower is converted into fruit. 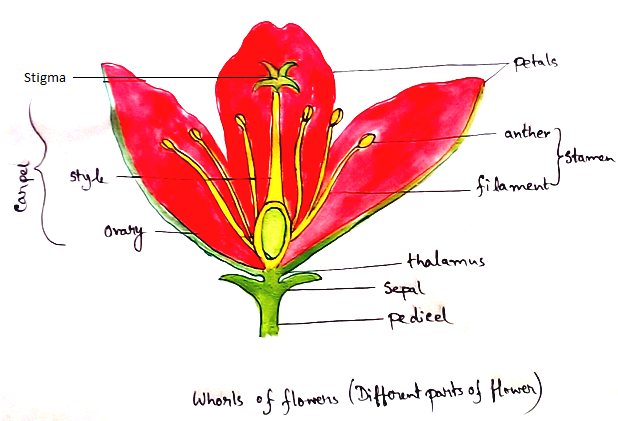 If there is a structure where sepal and petals cannot be distinguished separately are called perianth. Androecium: collective parts of the male reproduction is called androecium. It is made up of stamens. Stamen is made up of a filament,anther and connective. Anther contains pollen sacs which further contain pollen grains. Gynoecium: Collective parts of the female reproductive parts is called gynoecium. It is the innermost whorl of flower which is called pistil. It is made up of carpels. Carpel consists of ovary, style, stigma. Ovary contains ovules. When the gynoecium has one carpel, it is called monocarpellary ,if it contains two carpels,- it is called bicarpellary and if more than two carpels are present it is called polycarpellary. If the carpels are free the gynoecium is called apocarpous. If the carpels are united is called syncarpous. Above mentioned four whorls can be divided into essential (directly involved in reproduction), non essential (parts that help a plant in reproduction). A. Hypogynous – Ovary occupies the highest position on the thalamus means ovary is superior. Example- China rose. B. Perigynous - The thalamus formed a cup-shaped structure around the ovary. Ovary is half inferior. Example- rose. C. Epigynous – The thalamus encloses the ovary. Here the ovary is inferior. Example- sunflower. Complete flower: A flower which have all the four whorls (calyx, corolla,androecium, gynoecium) is called complete flower. Example, China rose, pea flower. Incomplete flower: Any one of the whorl is missing (androecium, gynoecium) is called incomplete flower. Example- cucurbita flower. Bisexual flower: A flower which contains both androecium and gynoecium is called bisexual flower. Example- mango. Unisexual flowers: A flower which contains either androecium or gynoecium is called unisexual flower. Example- cucurbita. Monoecious: A plant which has both staminate and pistillate flowers borne on the same plant. Example- corn. Dioecious: Staminate and pistillate flowers are present on different plants. Example - Mulberry. Arrangement of ovules and placenta within an ovary is called placentation.